Interesting little pub a little out of town so pretty quiet when I went there. Only one beer worth drinking when I was there (Thwaites Wainwright), but it was in good condition. Bit expensive, but suppose given it good position I should expect the price's had Theakston and Wainwrights on when in today and was good quality . Its a lovely Pub but why change the name? Food was plain but very well cooked when we went and very very good value. Recommended. My second call on my Usual Suspects trail, and now called The Dropping Well is a quaint old pub, with Theakston's Best and Old Peculiar as regulars, with the occasional decent guest ales such as Deuchars or Hopback Summer Lightning. Sadly on my first visit the Summer Lightning went off, and so had the Best, so I was saddled with Old Peculiar, which isn't my favourite tipple, but a good pint nontheless. Service is usually pleasant but perfunctory, and I have yet to be tempted to eat there, though I look at the dishes on offer and wonder if they are as goods as they sound. Too many pubs want to serve food that is covered in a 'jus' of some description, when I'd be happy to settle for gravy instead. 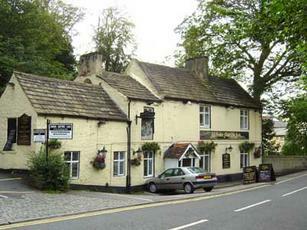 After that I move back over the bridge to walk along Waterside to The Mitre. This once great Knaresborough pub has suffered down the years from the policies of pubcos, and their disregard of what a little treasure this place was and could be. Several indifferent landlords have come and gone over the last few years. On Saturday 19th December, it re-launched itself and a very pleasant couple are to give it a go. It will still retain pub facilities (as I believe it has to do) but the accent will be on food. Let's hope they get the balance right. Only Theakston Bitter available when I called but it was a well kept pint.